Neenah, WI - Falls are the leading cause of death among private industry construction workers. (Source: OSHA) To help companies teach their workers about fall hazards and protective measures, J. J. Keller & Associates, Inc. has developed its Fall Protection For Construction training program. Created by an in-house team of experts in regulatory compliance and curriculum development, Fall Protection For Construction helps satisfy OSHA’s fall protection training requirements (29 CFR 1926.503). The program covers fall hazards and ways to eliminate or prevent them; types of fall protection equipment and scenarios when each would be appropriate; and how to properly select, inspect, use, and store fall protection equipment. 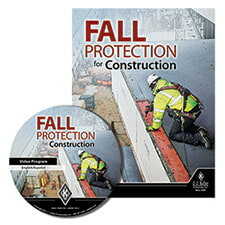 Fall Protection For Construction is available as a two-in-one program English/Spanish DVD, and in Video Training Book, Pay Per View, and Online Course formats in both English and Spanish. To learn more, visit JJKeller.com/200759. Safety professionals rely on J. J. Keller’s in-house expertise and wide selection of products and services to reduce risk and improve regulatory compliance, performance management, and operational efficiency. For more information, visitJJKeller.com.